You probably don’t remember the first time we met, but I do. I heard a lot about you before I moved to Berlin. People said you were one of the best things the city had going for it. They said you were someone I had to meet. I didn’t know what the big deal was because I assumed you’d be like the kebabs back home, skewered chunk of chicken and vegetables with a side of saffron rice. I laugh when I read that now. How wrong I was! Do you remember that Tinder date? I met Hannes on a balmy spring day. I was not attracted to him. Nevertheless, I was bored and alone in a new city and grateful for the company. Hannes and I wandered around Prenzlauer Berg, Hannes chain-smoking and telling me about the job he lost, me nodding along and wondering if I would ever meet a Berliner with a job. Since Hannes had all the time in the world to play tour guide, he suggested we linger over döner kebab for lunch. He took me to Ilayda on Schönhauser Allee. You were the first thing I noticed when I walked in the room. Yes, you were skewered meat—but at scale. You looked like the drumstick of a Tyrannosaurus Rex stabbed lengthwise with a Samurai sword. Your size left me breathless. Hannes was jealous—who could blame him? He tried to rob you of your mystique by way of explanation. 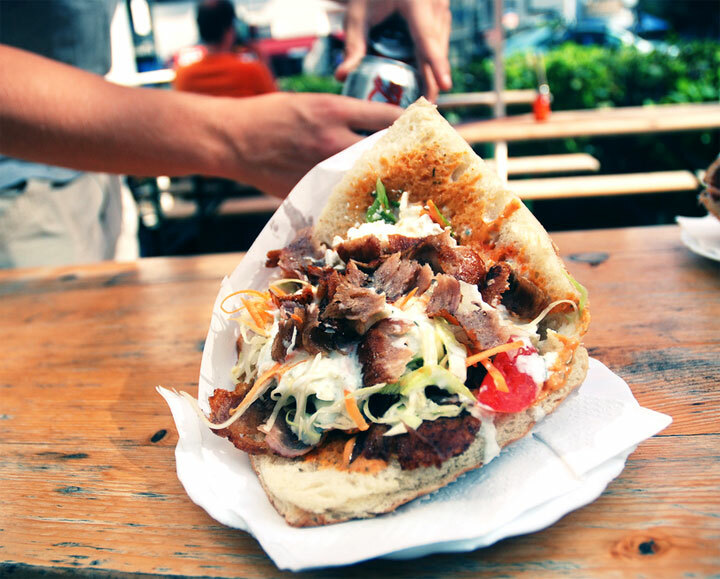 Döner kebab, he said, is a Berlin riff on a Turkish delicacy. Rumor and the Association of Turkish Döner Manufacturers has it that, in 1972, a Turkish immigrant named Kadir Nurman set up a food stall outside the zoo. At first Nurman sold typical Turkish fare—skewered grilled meat, salad, and bread.⁠1 The skewered meat concept wasn’t new to Berlin. Nurman was one of thousands of Turkish citizens to emigrate to Germany in the 1970s, and many others brought döner—which translates as “to spin or rotate”—with them. Nurman, however, noticed that his working-class German customers often ate lunch on the go. He began stuffing the grilled meat and salad inside the bread to make it easier for Germans to hold kebabs in one hand and, say, fit pipes with the other. Döner kebab’s novelty lay in its format, not its content. As Hannes spoke, I was aware that words were coming out of his mouth, but I wasn’t listening. Your meaty strip tease hypnotized me. You gyrated around your skewer in slow, steady circles. You dripped chicken fat in the aluminum tray without ever actually touching it. You glistened under the heat lamp. It was obvious that you were all-natural. I had seen lesser döner kebabs and they look like manufactured meat cones. You, by contrast, flaunted your raggedy chicken bits. Flesh, skin, fat, breasts—you put it all on proud display. Hannes ordered two döner kebabs “mit alles” (with everything). The man behind the counter approached you with reverence, shaved off a bit of meat, let it fall to the aluminum tray, and hacked it into a heap of hen goodness. Then he took a square-shaped handkerchief of bread and painted the inside with blood-red chili paste and garlicky yogurt. He tucked your meaty bits into the bread, folded it diagonally, and with flourish added a confetti of iceberg lettuce, shredded cabbage, diced tomatoes, and chopped onions. I would later learn that inferior establishments display their toppings in Plexiglas aquariums with mosaics of parsley, shredded carrot, and corn. Ilayda kept its accouterments in loving disarray. The storefront was too busy slinging out best-in-class döner kebabs to arrange vegetables in cross-stitch patterns. When we made contact, you might remember that I was a little awkward. I undressed you slowly, first peeling back your foil wrapper, then pushing aside your wax paper. Then I hesitated. I wasn’t sure where to start. Should I have I nibbled at your triangular tip and worked my way into you with successive bites? Should I have plunged into your meaty center and nipped along the edges? I would have given the matter more consideration but you were full to the point of bursting. I dove in for a bite just as you threatened to tumble out of your trifold of bread. Hannes paid for the döner, with what money I don’t know. Then he took pictures of me eating, which was creepy. I was so in love with you that I didn’t care. I got lost in your nooks and crannies, your puddles of chicken fat, your daubs of garlic sauce, your crunch of cabbage. Lust made me forget my manners, and lettuce fell from my mouth while sauce dribbled down my chin. I’m sure Hannes’ pictures turned out great. My tryst with Hannes was short-lived, but my relationship with you, döner, has endured. I’ve found every excuse to see you over the past few months. I’ve not always been my best (read: sober) self around you, but you’ve been there for me no matter my blood alcohol content. The more I get to know you, the more I hope you never change. Too often this world turns good, honest street food into pretentious, truffle-scented first courses. I’ve seen it happen to hamburgers, hot dogs, and ramen, and I’m afraid it will happen to you. How long until Berlin’s bad-boy chef Tim Raue reimagines you with Kobe steak, cress, and black garlic sauce? Is it inevitable that a missionary vegan will someday dress you up with macerated strawberries and burnt quinoa? Please stay true to your roots. You were invented for Berlin’s working-class and have become a staple for Berlin’s non-working class. I need you and I love you just the way you are. Stay cheap, stay greasy, and don’t ever stop spinning in the window. PS: Don’t listen to the rumors about me and currywurst. I would never be unfaithful. It’s not the size of the sausage that counts—it’s what you do with your meat. The above love letter (of sorts) was excerpted from Let’s Take Berlin, a series of essays about expat life in Berlin by American expat Jessica Guzik. Let’s Take Berlin is available for Kindle and paperback at Amazon.com.